I don't really love sewing the same thing over and over again. But these pajama pants are so functional. They hold up forever. And I ordered three yards of flannel on sale last November that was just waiting to be sewn up. So when it came time to make another pair for Evie, I decided to give this pair a little creative flair. To add the ruffle to the pant leg, I cut a 19"x3" rectangle (for her size 2T pants). I gathered one long side and then sewed the short ends together with a 1/4" seam allowance. 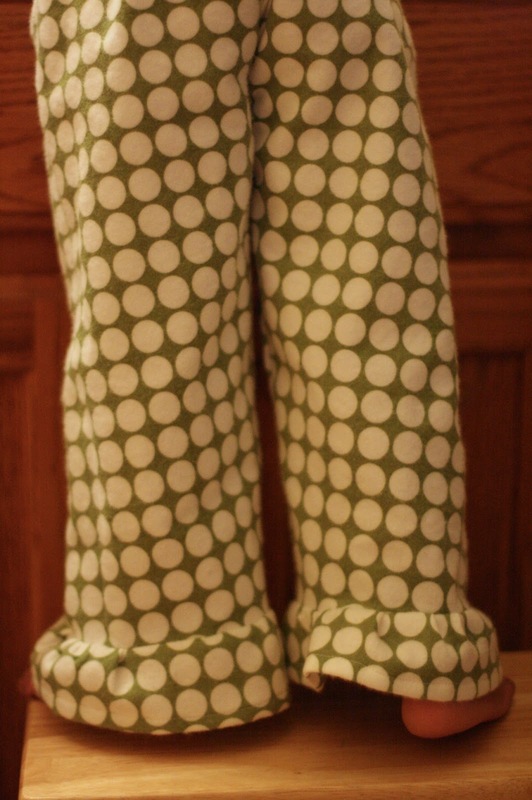 I sewed the gathered edge onto the (sewn) pant leg, right sides together, with a 1/2" seam allowance. Then I finished the other side with a narrow hem. 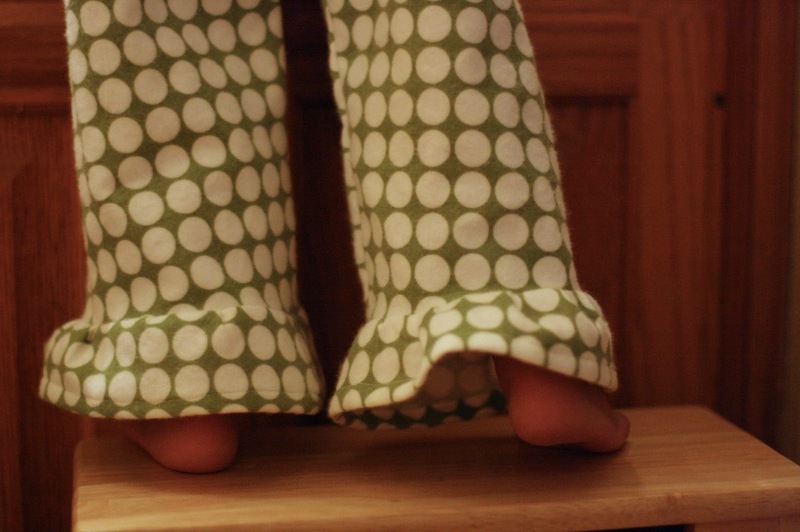 I had cut the pants in a 3T length, so adding the extra length of the ruffle made them a little too long. But I just folded the waistband over and they will now fit for a really long time. I had planned to make a pair for Jude (sans ruffle) in this same line of flannel, except in brown. He's too big for me to cut one pair of pants from fabric folded in half, selvage to selvage, so I had to cut each pant leg separately. I forgot to flip the leg pattern over when I cut the second leg. Therefore, I ended up with two left legs. Ah yes, the dangers of sewing while sleep deprived! I just don't know if you hear enough how amazing you are! Just sayin'!!!!! I am making these pajamas and discovered tonight that I too forgot to flip the leg over when cutting the pattern. I want to shoot myself. How did you correct that? I thought I was almost done. I don't have enough fabric to recut. I have rigged something up but I fear it will be ridiculous as now my son won't have a front or back to the pants.